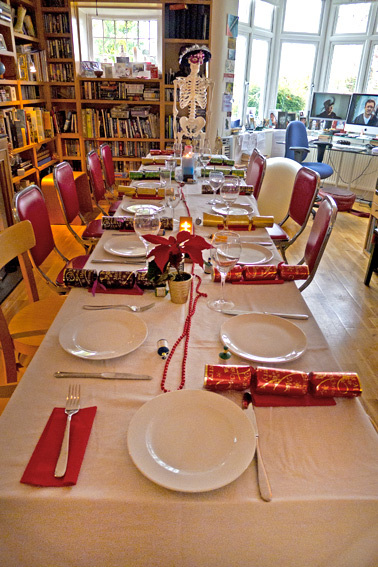 I had Christmas dinner with Rick and Su, in Golders Green. It was a reasonably large group of 13 plus Syd the skeleton (in desperate need of sustenance). 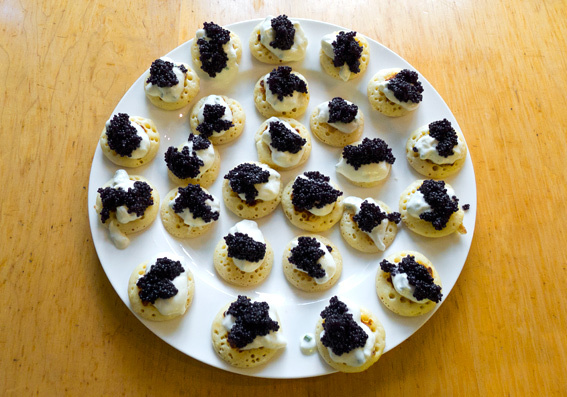 I arrived early, to help with the cooking, but the blinis were already on the table, topped with sour cream and caviar. I brought a 2 lb chicken liver paté for the starter, but I’ll cover that with a recipé in my next post. 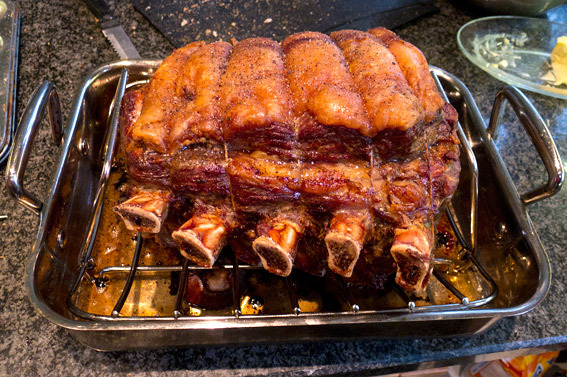 A 5.5 kilo rib of beef had just gone into the oven and was sizzling away nicely. 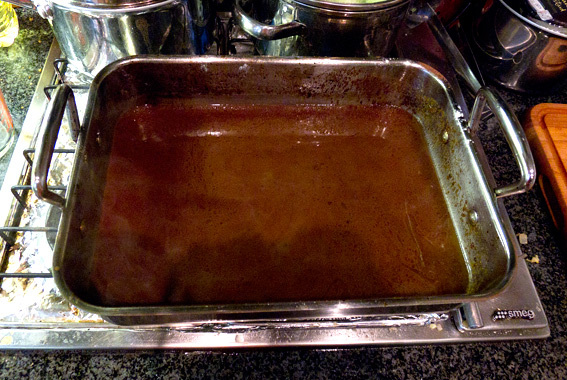 I cooked a vegetable stock, which once the beef was cooked, was added to the beef juices to make gravy. 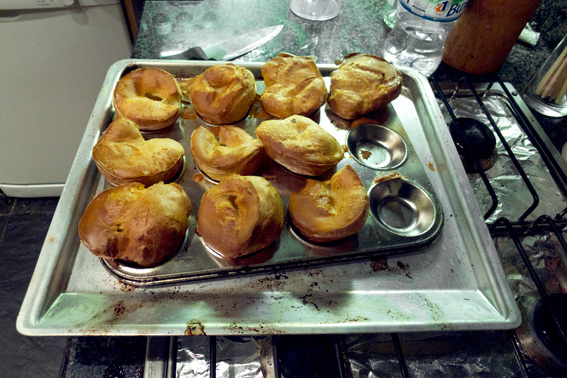 Rick made two trays of roast potatoes and Su made beautiful Yorkshire Puddings, which I failed to photograph (though you can see some she made back in October, here). 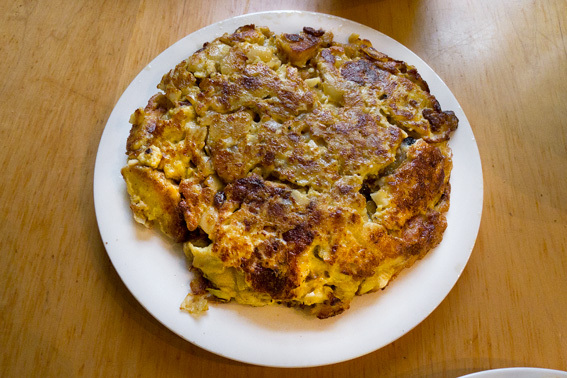 made with 6 beaten eggs, 3 small fried onions, olive oil and 6 pieces of garlic. Just as the tortilla was looking perfect, I flipped it for the final time and the handle broke on the frying pan, sending tortilla everywhere. 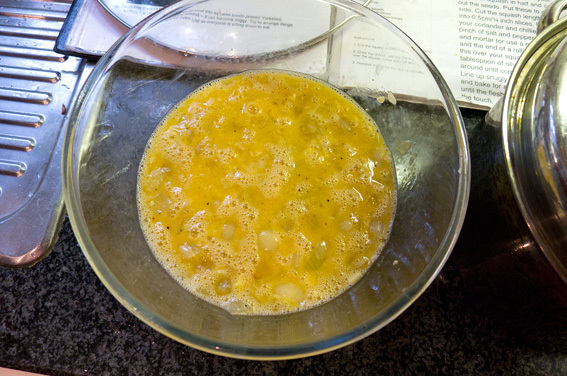 I managed a semi resurrection with the addition of 2 more beaten eggs and a bit more frying, though the substitute frying pan was larger, so it was hard to reform it completely. 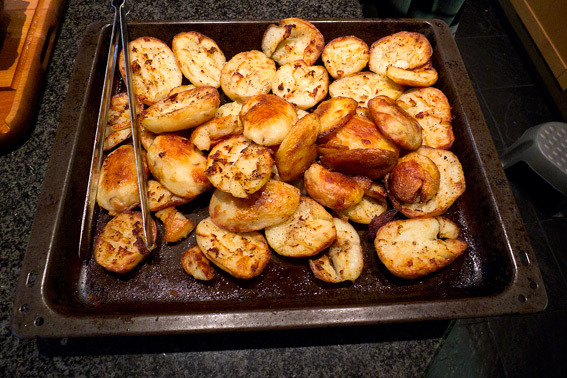 When the beef had rested for 30 – 45 minutes and the accompaniments – carrots, gravy, leaks, roast potatoes and Yorkshires were ready, we took it in turns to carve. The beef looked beautifully pink and bloody. It was an excellent roasting joint and very tender. 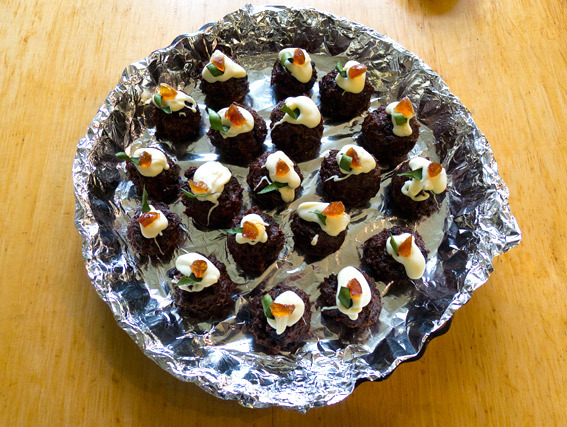 Pudding was a large Tiramisu and or mini Christmas Pudding, remade from a single large St. John Christmas Pudding. 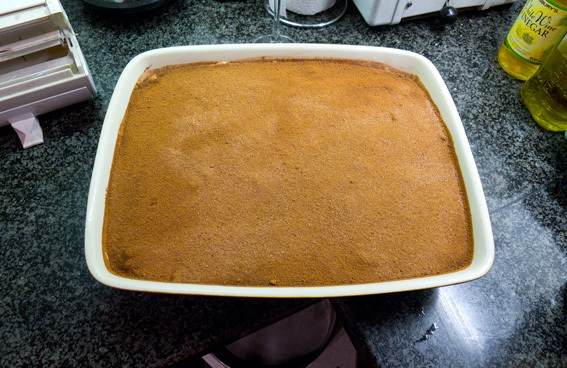 I flamed my pudding with a little Somerset Cider Brandy. Like everything else from the St. John, the pudding was gorgeous. 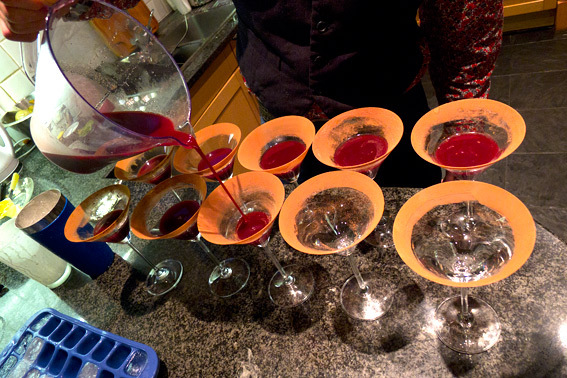 Throughout the day, Sam provided us with a diverse and delicious range of cocktails, including Black Forrest Gateau (above). 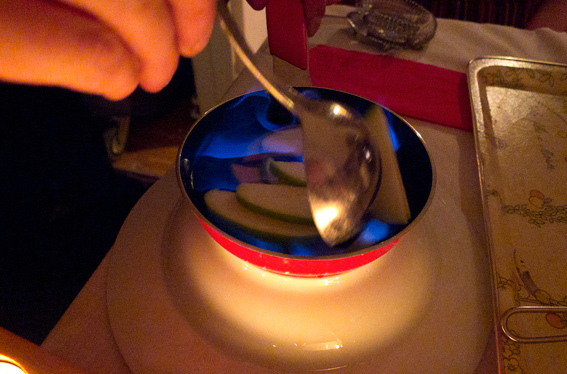 One of Sam’s Christmas presents was a mini frying pan – on opening it, he immediately set to work flaming apples in alcohol for yet another great cocktail! 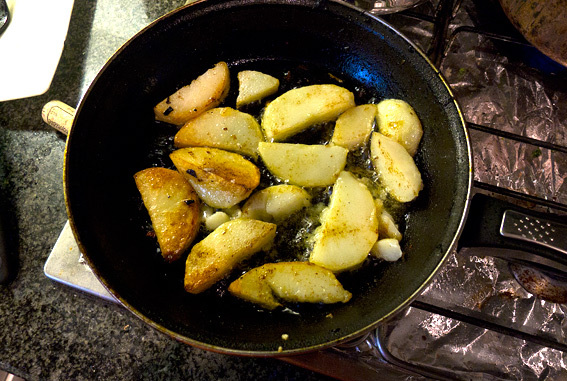 I had a wonderful day, as did everyone else – for me it was made all the more fun by joining in with the cooking. This entry was posted in Drink, Eating Out, Fish, Food, Meat, Recipes, Restaurants, Shopping, Spanish and tagged blinis, caviar, Christmas, Christmas Pudding, cocktails, rib of beef, St. John, Tiramisu, Tortilla Español, Yorkshire Pudding. Bookmark the permalink. 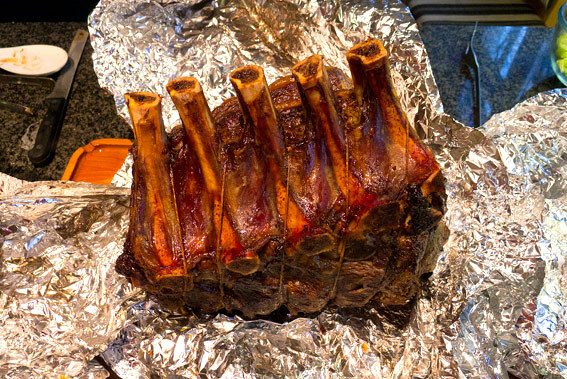 Great record of a superb Christmas dinner – beef is definitely the zeitgeist. There’ll be celebrations amongst the turkeys! Thanks! To be honest, I’m off turkey, though I wouldn’t say no to goose or duck (which I had yesterday). I hope you had a good time too. Hopefully you’ll do a post about your big feast. That’s very funny about the tortilla…and it looked so perfect too – I almost wanted to eat it instead of beef! You can’t make a good tortilla without love – it reminds me of the book, “Como Agua para Chocolate”. The beef looks amazing! 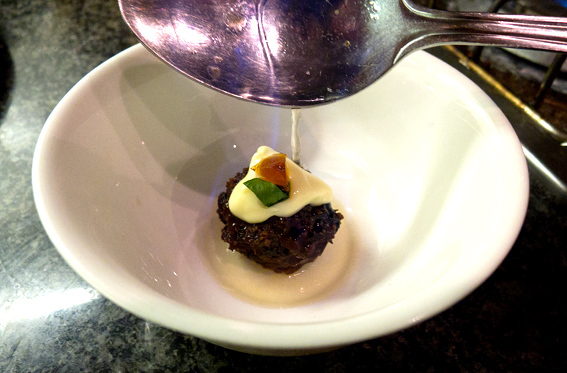 Beef is always our family choice for celebration dinners, as it will be on New Year’s Eve. Pity about the tortilla accident, but I’m sure it still tasted as delicious! What a wonderful meal and day you had. It is a shame that the handle had to break but the taste of your tortilla was still good I’m sure.